Dictionary.com’s new, free app for the iPhone and iPod touch offers a solid online dictionary. Dictionary.com boasts more than a quarter-million word definitions, and 80,000 synonyms to boot. The biggest hurdle that Dictionary.com must overcome, though, is Mobile Safari. While the app does everything it should, it doesn’t necessarily outperform a simple Google search via the iPhone’s browser for the word whose definition you seek. Spell It Out: Dictionary.com offers more than a quarter-million word definitions and 80,000 synonyms—all for free. In Dictionary.com’s app, it’s pretty easy to look up words. The app auto-suggests words as you type, instead of providing the iPhone’s standard typo correction. That mostly makes sense, but it gets a bit confusing if you don’t know how the heck to spell the word you’re looking up. 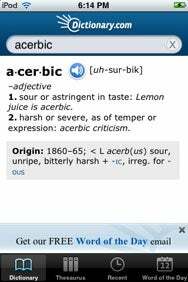 If you start to type in “ascerb” (on your way to the misspelled “ascerbic,”) you’ll get no suggestions as you type at all; only after you submit your search will the “similarly spelled” results screen appear (with “acerbic” as the first suggestion). Definitions for all the words in the database are stored right on your iPhone, so unlike my proposed Google alternative method, you can look up words even when you have no cellular service and no Wi-Fi. Note, though, that you don’t get those “similarly spelled words” results if you’re not online. And while the app offers clever features like audio pronunciation and Dictionary.com’s popular “Word of the Day,” you’ll need a connection to make either of those work, too. Overall, the app is solid, and it works as advertised. I did find that typing stalled a bit when the app had a lot of type-ahead suggestions to offer, and it can sometimes take a noticeable half-second for definitions to appear—even though they’re all residing on the device. If you find yourself needing definitions frequently—especially when you’re offline—the Dictionary.com app performs capably. But if you only need definitions on rare occasions, Google can likely serve as a fine alternative. Dictionary.com is compatible with any iPhone or iPod touch running the iPhone 2.2 software update.